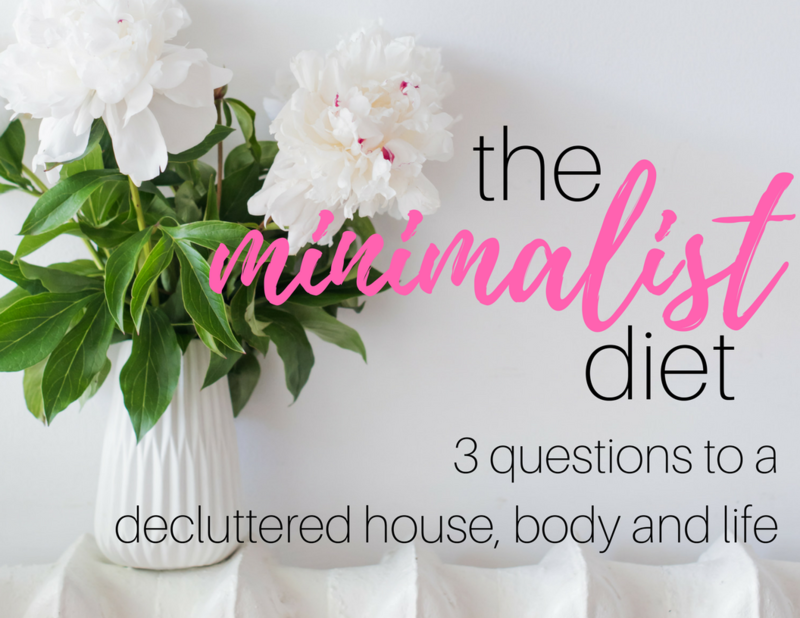 Minimalism is generally seen as a major downsizing lifestyle change. That’s great and can absolutely part of it, but to me minimalism has come to be so much more than that. Working your way toward minimalism really starts more in the mind than anywhere else and has the power to change multiple areas of your life. The more you work toward clearing the clutter from your space, your mind, and your life the more you are able to get intentional about the things you really want out of yourself. Getting intentional also means you gradually drop the need for things you used to think you had to have. In my life those things have been my schedule, my shoes and junk foods. Let me walk you through how I gave myself and my life a full makeover with the minimalist diet and how you can too. Having a minimalist mindset has totally shaped me into a happier, healthier more at peace person than I ever used to be. People hear about the minimalist movement and assume that it is all tiny houses and living with nothing but a bed and a back pack. Let me take a moment to put those rumors to rest and tell you that minimalism goes far beyond things. In fact, that’s the point entirely. Minimalism means not letting things have a hold of you anymore. That could mean materials, foods or even a job status. At the end of our lives, we can’t take any of these things with us with we go. You won’t remember the closet of clothes you wore or your super awesome car. The job title you had in life won’t matter. How you lived will matter, who you made an impact on will matter. Having a minimalist mindset can mean stress free living, a healthier lifestyle and no more debt. Minimalism can mean maxing out on the things that bring you the most joy rather than the things that take joy away. Sinking Funds. Small Steps Toward a Big Savings. When you are taking steps toward minimalism it is absolutely essential that you know what you want out of life. Get specific and don’t let anything deter you from your goals. So take a moment to really daydream about everything you want from your life. By the way, it’s ok if some of what you want is stuff! Personally, I want a life where I don’t spend my weekends doing a ton of yard or house work. Major efforts have been made to avoid it in fact! I want to travel, soak up my family and friends, feel good in my body, live a long time and do it without financial stress. This is coming from a girl who used to buy a new pair of shoes (or more) every month. I had believed shopping was essential to my happiness (when really it added to my stress.) In fact, credit card debt was something I enjoyed racking up and paying off. It was an endless cycle of temporarily getting what I wanted (or what I thought I wanted) and never getting what I really needed. If you are trapped in credit card debt, get your free credit analysis to help you avoid my same fate! It’s the first step in the right direction when it comes to getting yourself back on your feet! On top of constantly racking up debt, my family and I would also take fun, long vacations and we would buy a ton of souvenirs. It was Starbucks on the credit card every day and eating out at all the coolest places. Nothing was off limits. While none of of these things are bad things, they were ultimately taking me away from most of my goals. We didn’t budget for a single dime that we spent on vacation. There was no budget and no savings plan set in place. No surprise, after vacation ended, it was like a hamster wheel of trying to play catch up and get the credit card paid off. Our cupboards were filled with mugs, and shot glasses from different cities and places that wound up spending 364 days a year collecting dust. On top of that, eventually the kids grew out of their souvenir t-shirts and now they are sitting in a memory box surviving no purpose. All that money we spent and nothing to show for it. So, how did I stop this cycle and start making major change? Let me show you how these questions work with shopping purchases, food choices and life choices. “Is this getting me toward my final goal?” No. My final goals are to travel, to have excess money to ensure my family is taken care of. “Do I need this, or do I want this?” I want these things. I have a closet filled with dresses and shoes that I loved just as much as these when I first bought them. “Could I substitute this?” If I need a new outfit for a wedding, I can borrow or wear something I already have. I’m so thankful now to have realized just how many ways there are to save on the things that I buy in every day life. Taking advantage of discount apps and savings sites has been huge when it comes to going out to eat, buying groceries or even planning for a trip! See how I double my apps for more money back. Thankfully, we have gotten smart about our finances, we save for vacations, stick to a budget, and have a smarter savings plan in place. I even took all of our go-to budget worksheets and put them into a bundle for you to access and take advantage of if you and your family are working to get on the right track financially. Food has been a struggle for me. I think it is for everyone at some point; whether it’s getting too much or not getting enough. Once I started living more minimal, I started to be able to listen to my body better. It became clear what was’t good for me. Nights used to be spent in front of the mirror feeling bad about myself. It seemed I was always feeling bloated and unhappy. When I started to realize that I had a gluten food intolerance, I began to realize that feeling bad at the end of each day was a result of eating certain foods. Most people who struggle with food have a certain weight goal they are trying to reach and thinking about that goal naturally makes the food aspect that much more tempting. Constantly checking the number on the scale just tricks your brain. Minimalism helped me listen better to my body. Now when my family orders a pizza (and I can’t eat the gluten) I go through my questions. “Is this getting me toward my final goal?” No. My final goal is to feel good in my own body. This food will make me bloated, tired and leave me feeling bad about myself. “Could I substitute this?” I will either get myself a gluten free pizza that I can enjoy or simply have a different meal than my family. I know my priorities are to feel good in my body and eating well helps me obtain that. It’s no longer about a size or a weight goal. To help you get good with your health, I recommend checking out The Food Fix. Created by nutritionist, Heather Bauer, The Food Fix is laid out to help you learn healthy eating through a variety of meal plan and coaching options. “Is this getting me toward my final goal?” No. I used up my budgeting night out money. I want to make sure our finances are smart and get spent on what’s really important. “Do I need this, or do I want this?” I want a night out. I need a night out because these kids have been fighting all day and I’m gonna snap. “Could I substitute this?” Can everyone come over here? I have some snacks and could someone else bring the wine? Everyone saves money and we still get time together. If you get easily overwhelmed with the amount of “life” on your plate, think about getting a little more organized. There is a great organizational and simplifying planner that I absolutely love. It is laid out to help organize your meals, lists, schedule and more. When you start to think of minimalism think of it as a way of decluttering all the stuff that doesn’t really matter in life. The stuff that isn’t important. The more you clear out the clutter from your closet, cupboard or cranium the more perspective you gain. Getting rid of the excess helps you focus directly on big picture. With your tunnel vision focused on your big time goals, you will be totally unstoppable. I promise. Swap.com – You can now get 25% OFF all orders over $100 with code SAVE25SPEND100 at Swap.com, which is the largest online consignment and thrift store. Oh man I just love this! We’re in the process of moving, so I’m taking this opportunity to simplify and de clutter. Thank you for the tips! Absolutely! Moving can be such a great time to realize just how much extra stuff you had! Best of luck!